The set of instruments for work with audio during import of files to the server database is identical for the operations of "manual" import in the applications Air Manager, News Cut and for automatic import of files implemented by Transfer Manager. You can view the detailed information about work with audio tracks during the import of files by this link. For import of a few tracks that contain multi-language audio, directly in the process of import you should use the instrument Source Track Layout that allows you to implement transcoding the initial tracks and form a few output tracks (audio programs) from them. Track is the audio program, audio track. The initial file may contain several programs/tracks, for example, the English track and the Russian one, stereo tracks and six-channel tracks (AC3, AAC etc). Channel is the audio-channel within the track (the maximal number of channels in all the tracks is sixteen). In the process of import, you should find the field Track Number in the window Source Track Layout and specify the total number of tracks in the output audio. Enter the number of the initial track into the field Src Track #1...8, enter the number of audio-channels in the initial track into the field Src Channels. In the field Src Codec you should set the type of codec for the initial track. The algorithm of identifying and decoding tracks is able to automatically define the parameters of tracks: when setting the parameters of the initial tracks, you may just set the parameters Any in the fields Src Track, Src Channels and Src Codec. In the field Dst Channels you should set the number of channels for every formed track, or activate the mode AC3 bypass (pass-through).
" level and placed in the finite file: therefore, in case of complete decoding the six-channel tracks you should enter the value "6" into the field "Dst Channels" (enter the value "2", in case of their conversion into the stereo pair). The maximal number of mono-channels in the finite file is sixteen. 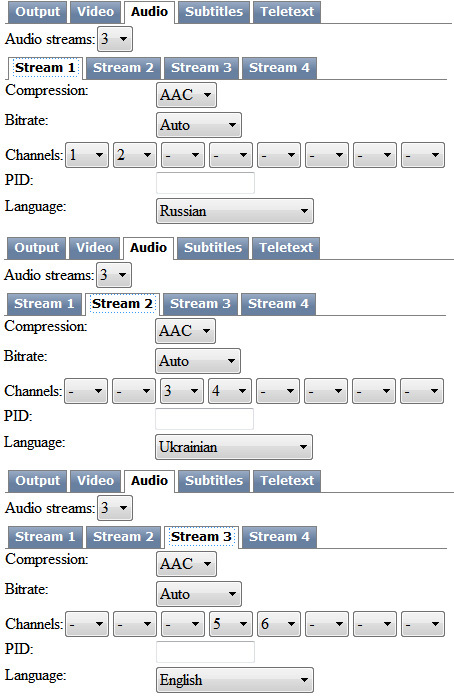 For forming three audio stereo pairs (for example, for the Russian, Ukrainian and English languages) you should find the field Track Number in the window Track Layout and specify the total number of programs (tracks) in the output audio - three; in the field Src Track #1 you should specify the number of the initial track that contains AC3/DTS data. 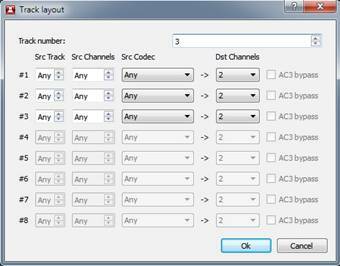 In the field Src Channels set the number of audio-channels in the initial track (six), or set Any. Specify the type of codec (AC3) of the initial track in the field Src Codec; enter the number of the output channels (two) in the field Dst Channels. After implementing this operation, the given AC3 track will be decoded and converted into the uncompressed stereo pair. You should implement the same operations with the rest of tracks: you may specify Any in the fields Src Track #1 and Src Channels for autodetection of parameters of initial tracks. You may download an example of AVI-file received as a result of using the instrument Source Track Layout that contains three PCM-stereopairs, by this link. The application Air Manager is configured with the default mode of displaying two audio channels. You can increase the number of displayed channels in the menu File/Configure, section Preview, item Sound Channels - the number of channels that will be displayed while viewing file materials in the window File Monitor. After applying changes you should reload Air Manager. SL NEO Program Player is the server module responsible for execution of playlist events - the module forms the so-called УprogramФ channel (Program Channel). Work with AC3-bypass tracks is an individual case. These tracks are not recoded and are used for playout in the output SDI, in the mode "as is" - AC3 Passthrough. is implemented from the control panel - Administrator Control Panel, as an administrator. After the login to the control console, choose Manage at the console menu. Find the section Program Outputs, then choose the item General in the window Playout Parameters. 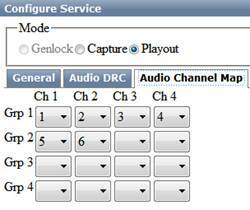 Find the field Audio Channels and enter the total number of uncompressed channels that will be formed by the module. In our example we have three stereo pairs, so enter У6Ф. SL NEO AV/TS Player is the server module responsible for compression, encoding audio/video data and forming the output stream. The procedure of configuring the function of forming DVB IP UDP/RTP and network broadcasting is described in details in here. Configuring the module AV/TS Player is implemented from the control panel - Administrator Control Panel, as an administrator. After login to the control console, choose Manage. 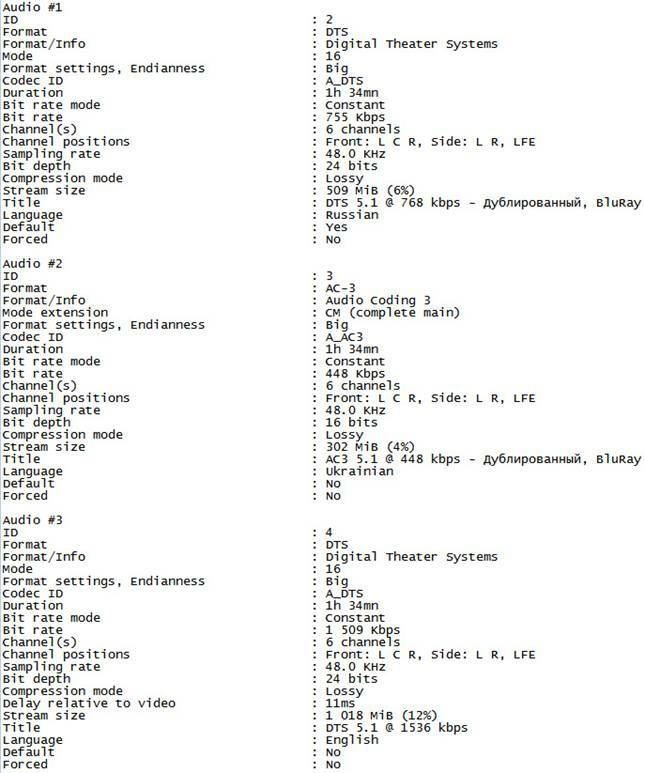 Choose the item Video IO Boards: if the service for encoding to IP is present in the system, press Edit in the window LAN Interfaces/Ethernet Adaptor. Now letТs pass on to the tab MPEG2 TS Parameters. Find the section Audio Channel Map and enter one after another all the mono/PCM channels that will take part in forming the output audio (in our example we have three stereo pairs, which means six channels - the maximal number of channels is sixteen). enter У3Ф in the field Audio streams. Open the field Compression in the section Stream 1 and choose the type of compression and the stream speed - Bitrate. In the field Channels choose the numbers of mono-channels that will take part in forming the track, specify the stream identifier in the field PID, or leave it empty if the value is Auto. Choose the language identifier in the field Language. The maximal number of mono-channels for one formed track is eight. You should implement similar adjustments for all three audio-programs. Adjustment of parameters is finished, press Apply Changes at the top part of the control console window. Herewith, the playout channel with the changed configuration will be reloaded, playback of the current channel will be stopped while reloading.